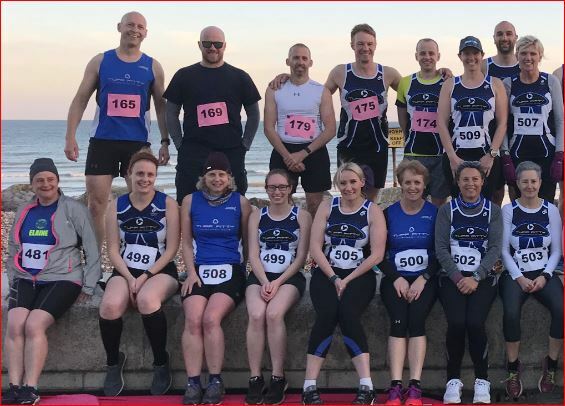 An evening’s 5k race along Worthing Promenade on a Wednesday evening instead of usual Track training. This was a chance to put the winter training into practise and a great number turned up whether Wednesday night runners or not. Whilst it was a sunny dry evening it was very cold as Team Tuff started to congregate outside the rowing club. 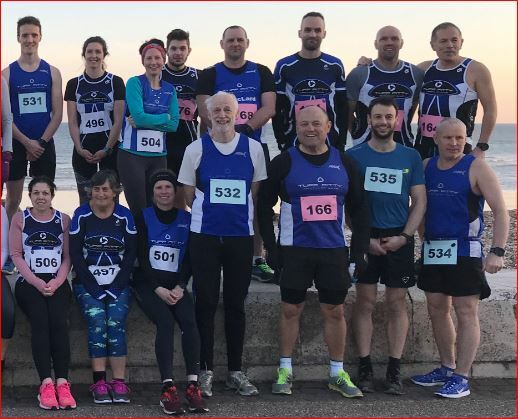 Apparently this year saw a record turnout and Lancing Eagles looked impressive with 57 entries, RunBrighton also appeared to have a strong team. However Tuff Fitty were not overshadowed. 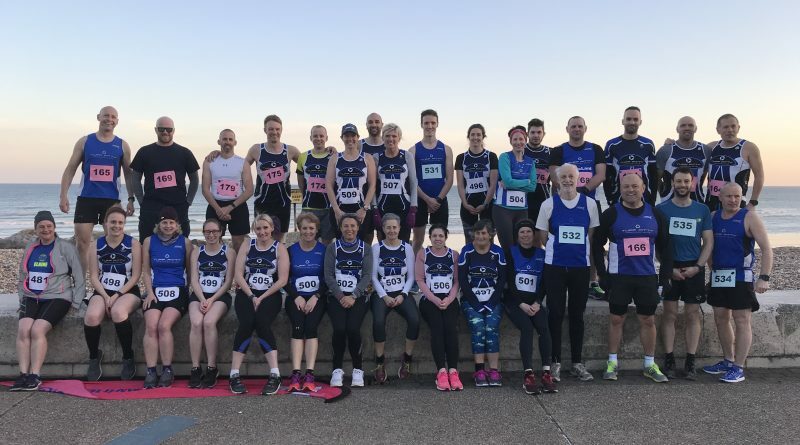 A last minute bundling of coats into the back of a car revealed the club’s true strength as Tuff vest clad runners lined up on the seawall for the traditional pre-race photo. 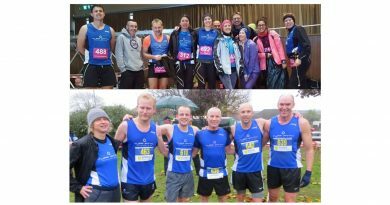 The above banner shot does not include all our runners, the Tuff total was 36 runners. The going was good westward to the turn cone, but coming back proved more difficult into the wind but it transpired that at least four club members would achieve PB’s. Our first runner home was Simon Thistlethwaite 5th overall in just 18:14. Andy Crawford 8th in 18:28, then Jon Babbage 10th overall in 18:37 and Ollie McDonald 13th in 18:52. 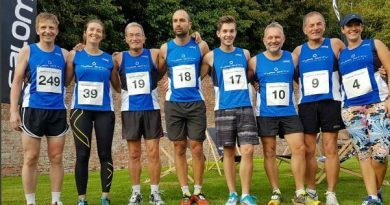 It was a very competitive field with 27 runners under the 20 minute mark including our very own Tom Goddard (19:14) Chris Robinson and Nick Bolding, both accredited 19:58. With just three different club vests ahead there was a chance of the men being the first four home. Meanwhile there was a fabulous turnout of Tuff Ladies. 14 ran under club colours whilst Debra Cauchy-Duval ran in a separate team and Elaine Rousseau ran for Lancing Eagles. Our first lady home was Juliette Reader who has been having a strong season in 22:05. Kate Cooper (23:33) was closely followed by Karen Mcgrath (23:37) and our fourth lady home completing her comeback from injury was Tiff Orton in 23:42. At the finish everyone changed quickly to warm up whilst the results were calculated in the Rowing Clubhouse. The ladies results were announced first and the Tuff Ladies team could not retain the title they have held for the last two years as a team from ‘Tom and Cathy’s Beach Hut Mob’ came away as clear winners, with Team Tuff in second position. Chris Sloggett, Debra & Matthieu Cauchy-Duval were three thirds of a mixed team called the Felpham Fitty’s and they also came home as second in the mixed team. Then it was the men’s result and it was a very tight finish with the title decided on the overall time of each teams first four. A theme for the evening emerged with another second position as a group of friends from different clubs did well gaining a 3rd 4th and 6th and they edged Tuff Fitty by just 2 seconds. 1:14:11 to Tuff Fitty’s 1:14:13. How is that for an exceptionally close finish. So congratulations to the Amos All-stars, but Tuff Fitty can reflect on a great evening’s work. Several headed off for a Pizza to celebrate. 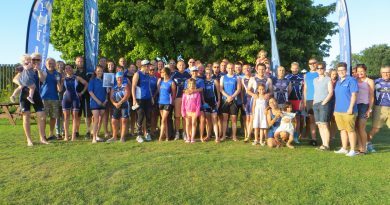 It transpires the Rowing Club are staging an Autumn return of the event on Wednesday 25th September if we can get a team together. A special thank you to Henry Teague-Smith, Debbie Gatland and Anthony Towers who came along to support. Below we have a photo gallery; click on the picture to see the album, then a name check followed by the results. Back row l-r –Chris Robinson, Grant Smalley, Nick Bolding, Simon Thistlethwaite, Ollie McDonald, Tiff Orton, Tom Gray & Sue Neilson. back row l-r – Tom Goddard, Catharine Western, Rachel Brunning, Stuart Harvey, Gary Edge, Jon Babbage, Lee Bishop & Clive Harvey. Front row l-r- Shelley Babbage, Claire Moyle, Kate Cooper, Chris Evans, Dave Priest, Phil Scales & Pete Littleboy.